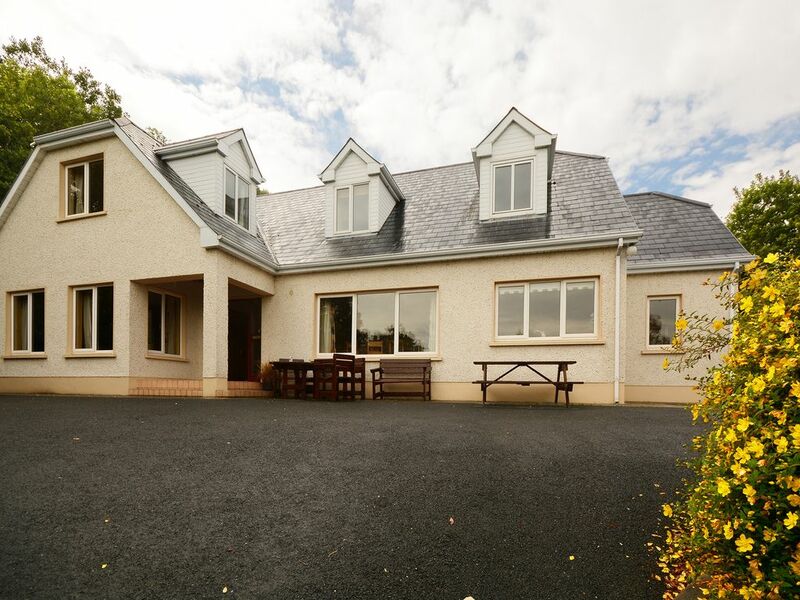 This stunning home sits in an elevated position overlooking Donegal Bay and the dramatic surrounding countryside, a stroll from the local beach, 1.5 miles from Mountcharles and 3 miles from Donegal Town. It has been tastefully decorated throughout with all mod cons, including free internet access, making for excellent family accommodation in a secluded, tranquil setting. In the evening, why not enjoy your dinner alfresco style whilst taking in the sweeping views!Shop. Pub. Restaurant 1 mile. Beach 400 yards. GF: lounge, kitchen/diner, utility room, double with ensuite shower room, double with single with ensuite shower room, bathroom with separate shower. FF: double, kingsize double with ensuite shower room, double with additional double, bathroom with separate shower.Electricity and oil central heating included, open fire with starter pack, linen and towels included, travel cot, high chair, stair gate, TV, satellite tv, radio, fridge/freezer, microwave, dishwasher, w/machine, internet access, electric blankets, welcome pack, partially enclosed garden, garden furniture, private off road parking. One small pet welcome. Stunning views from Doorstep - Stroll to beach. Our family pulled away from this extraordinary spot just hours ago and we haven’t stopped raving about what a wonderful time we had. The view was spectacular; the rooms were large, clean, and well-appointed, and the house was perfectly located just a few miles from Donegal town. We had 5 adults & 2 children — and loads of space to spare (2 bedrooms went unused!). We spent 6 days visiting family in County Donegal and Mountcharles— and had such a wonderful time that we’re already planning our return trip (to hopefully include a stay here!). This is a lovely house in a lovely setting. It was large enough for our group of 11. Very homey. Our family of seven adults stayed comfortably in this spacious bungalow. With the five bedrooms and five baths, we all had plenty of space. The kitchen was well equipped and had a nice long dining table to accommodate us all. The lounge had plenty of seating and a cozy fireplace for the chilly nights. We enjoyed the views of Donegal Bay from the front of the house and the short but hilly walk to the beach. The WiFi worked well and it was convenient to have a washer and dryer available. We stayed for six nights and took day trips to sights in Donegal Co. and had most dinners in the town of Donegal.